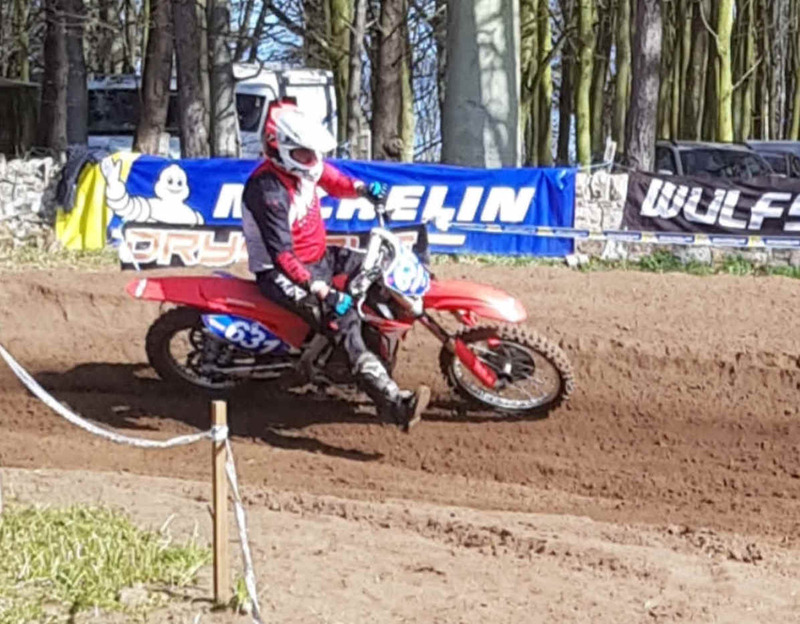 The first round of the 2019 Ecosse XC SACU Hare & Hounds Championship, sponsored by Rock Oil, Wulfsport, Michelin and Drysdale Motorcycles, got off to a solid start on Sunday the 31st of March, with almost 150 adult riders entered. Held at the now-established Tyninghame Links venue at Dunbar, the event ran six classes, catering for Expert, Over 40, Clubman, Over 50, Clubman B and Sportsman. All groups welcomed a healthy line up of riders, but the Sportsman category proved to be most popular with a heaving entry of 55 riders. They all started the day looking strong and ready for the challenge ahead, however, as the day wore on, the deep sand track, coupled with the heat and difficulties in the woods, took its toll on many riders, making them word hard for their final positions. Expert group winner Fraser Flockhart and runner-up Andrew Bisset were the only riders with 13 laps under their racing belts and, together with third and fourth placed Fergus Lamb and Ryan Burton held their positions from the very off with flawless flag-to-flag performances. Flockhart and Bisset battled hard throughout those arduous 13 laps, with Flockhart bettering Bisset by just over a minute. Alex Owen won the Over 40s class with a tally of 12 laps to place him ninth overall on the day. Behind him, runner up Mark Ritchie made astonishing progress, completing 11 laps and finishing 11th overall after a lowly 95th starting position. The top seven Clubman riders all posted 11 laps with Steven Currie Jnr just pipping Bradley Craggs and new-Beta-300-mounted Les Moody, to the post. The Over 50's top three also put in 11 laps, with victor Andy Dean marginally ahead of Rob Swinbank, after a race long close tussle, with third-placed Andrew Maben a further three minutes back. On paper, Pauly Baxter was the winner of the Clubman B group but such was his time and pace that his result of 11 laps in just over three hours and 18 minutes - a clear 18 minutes faster than the other class competitors - was good enough to position him eighth overall in the Clubman class. In the name of fair play and true sportsmanship, he decided to move himself over to the Clubman championship, paving the way for Kevin Watson to be crowned the Clubman B class winner, ahead of George McBeth and Matty Cameron. The crammed Sportsman class saw just one rider completing 11 laps, namely Jack Horne who took the spoils ahead of Joe Horne who completed 10 laps. In an evenly-matched contest, both riders posted best lap times of 16:56. Henry Ryle rounded out the Sportsman podium, also with 10 laps. Round 2 of the Ecosse XC H&H is on 5th May 2019, back at Tyninghame Links. An incredible turn out of around 50 riders proved that, if the event is right and the classes suitable for all abilities, there are plenty of young riders (and parents) willing to take to the line. 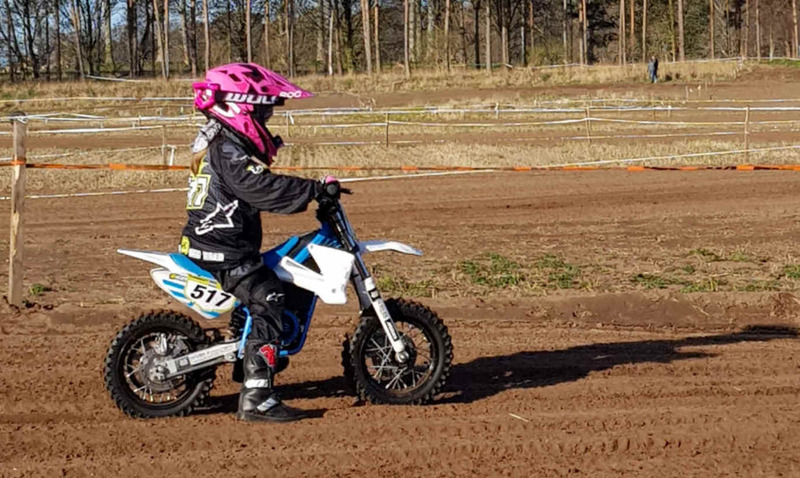 The classes catered for 125s, 85s BW/SW, 65s Juniors and Autos, and there were a number of first-timers on the track, who managed to complete a few laps, as well as more experienced competitors. Just four riders posted 10 laps apiece; Shay Page who was flying in the 125 class. He took the lead from the start and never looked back in a crowd-pleasing performance that witnessed plenty of showboating with big jumps, whips and wheelies. Brandon Burns gave him a good run for his money, finishing second in class but BW85 winner Jay Cheel took the overall runners-up slot, with SW85 runner Cristina Palmer taking the 85cc group holeshot, winning her category and taking fourth overall on the day. Second and third-placed BW85s Sam Boyde and Kieran Sives, along with SW85 runner-up Hayden Moody were on form, setting laps times quicker that the rest of the 125cc field and completing an impressive nine laps each in the process. Alex Morris rounded out the 125s podium with 8 laps, whilst Dylan Davidson did the same in the SW85s. In the 65s class Jim Lyndsay and Hayden Steele finished seven laps to take first and second with Daniel Drysdale in third on six laps. Worth of mention is Iver Codling who, in the BW85 class, had something of an up and down day; he started way down the field in 31st then worked his way through to seventh before dropping back to 29th and then up to sixth - this pattern continued throughout the entire race until he managed to claw his was back to 10th overall and held that position to the line. The youngest riders in the Auto class gave it their all. Jack Wade gave it full throttle and stunned the spectators with his five laps of pure determination, whilst little Georgia Lilyguy in her first-ever event pushed herself to finish a whole lap and win the wholehearted support of the crowd. All riders qualified for a trophy and the stage is set for this increasingly popular championship to gather steam as it heads to the second round hosted by RAW Enduro on the 28th of April at Norwood. 125s; [10 laps] 1. Shay Page, 2. Brandan Burns, [8 laps] 3. Alex Morris, 4. Andrew Murdoch, 5. Jack Hughes, 6. Archie Stewart. BW85: [10 laps] 1. Jay Cheel, [9 laps] 2. Sam Boyde, 3. Kieran Sives, [8 laps] 4. Robbie Gray, 5. Lewis Hutchinson, 6. Billy Rippon. SW85: [10 laps] 1. Cristina Palmer, [9 laps] 2. Hayden Moody, [8 laps] 3. Dylan Davidson, 4. Zac Cheel, 5. Charlie MacDonald, [7 laps] 6. Robbie Davidson. 65s: [7 laps] 1. Jim Lyndsay, 2. Hayden Steele, [6 laps] 3. Daniel Drysdale, 4. Jack Houghton, 5. Ruben Trew, 6. Brooke Mudie. Autos: 1. [5 laps] Jack Wade, [1 lap] 2. Georgia Lilyguy.